Is there any difference between having an email, phone or in person reading with you? To me, there is no difference as I can connect strongly with you regardless of which reading method is used. I always make a powerful connection with each of my client friends so that Spirit can come through and provide the best and most accurate reading possible. I love doing email and phone readings with my client friends, and when I go on tour it's always nice to meet them face to face at my in person reading events and lectures all over the world! As a popular leading internationally renowned psychic, how do you keep your rates so low, given the fact that others in your league charge hundreds (if not thousands) of dollars for a single reading? My mission has always been the same -- to reach out and offer psychic and spiritual help and guidance to anyone who is in need or in search of it -- part of my mission has been to keep the rates low so that not just the rich can afford to partake in my gifts. I could not go to sleep at night charging what some other psychic mediums charge as no one should have to pay hundreds or thousands of dollars to receive an accurate reading or messages from a loved one on The Other Side. Naturally, I have to pay bills and taxes like everyone else and there will be increases to my rates from time to time (my rates increased slightly in January 2009 -- the first rate increase in over four years!) but part of my mission has always been to be the 'people's prophet' (as my Guides calls me) and be available to everyone, and keep the rates as low as possible so that all people from all walks of life and backgrounds may be helped. When did you first discover you were a medium? I first discovered that I was psychic when I was four years old. I began to see people, places and things that others couldnt. I knew long before 9/11 that was going to be disaster in New York City but no one listened and then it happened. How is a medium different from a psychic? A medium can make contact with the spirit relatives of the person they are providing the reading for. 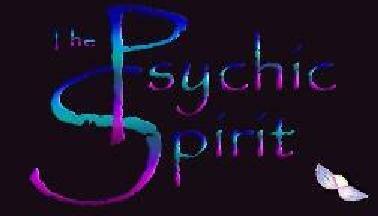 A psychic is someone who can pick up information about the living person's life, after life and past lives. Most all mediums are also psychic. Do you see the spirits? I see, feel and hear spirits, ghosts, angels, guides and all people and entities from the spirit world. What do you experience when a spirit is trying to communicate with you? I see pictures and hear the voice or voices of the spirit or spirits wishing to communicate. Are you ever scared when a spirit starts talking to you? The first few times it happened, I was very young, so of course I was a bit scared. But now it's easier, and when I can help people - it really makes it worth it. Do we live on after physical death? Absolutely. We'll continue on thru the great Holy Light and begin to plot and plan our next life, visit old friends, relatives and animals that have crossed over. And we'll also talk to our Guide and Angels about when and if we decide to come back to this Earthly Plain and try it again. The spirit is immediately separated from the body and begins to vibrate at a significantly higher frequency in another dimension. Does everyone have spirit guides? Yes, we all have our guides. We all need our guides to protect us and guide us thru life, as we also need our angels, too. Have you ever been giving a private reading for a person and no spirits step forward? Not normally, but there may be a time when no one wants to communicate. It's very rare because almost always when someone who has passed over, they always have something to say to their living spouses, children and friends. Can anyone who dies communicate with their living relatives? It's all a belief system. You have to believe in the power of after life communication. If you dont believe it and your just looking for a freak show, then you wont get far. However, some of the best reunions with past loved ones are in our dreams. That's why its always important to ask God to allow you to remember your dreams when you wake up. Can anyone learn to communicate with the Spirit world? Yes. If you've lost someone very important to you, then ask and you shall recieve. It's very important that when you feel a presense and you know very well who it is, that you validate it by saying "Hello Dave" or whatever their name is. Validation to spirits is very important. You'll get more activity if you validate who they are. If I'm giving a client a reading, I'll give them names of spirits that are attached to them - in life or on The Other Side. Ghosts are not spirits, not by any means. They are vivid images held in time and place. Like a video recording that can be played back time and time again. Yes, spirits can. If they choose too. We are all given that choice to either grasp eternity, or shoot right back out again and learn more on Earth in a new body, but with the same subconcious spirit. Why do some spirits stay in the Spirit world and others reincarnate? Some spirits choose to progress and learn in the spirit world, while others may feel they have more to learn in a physical world. The below questions are frequent questions that we receive from clients. Q. What/Who is The Psychic Spirit? Christopher founded The Psychic Spirit organization for psychic services, spiritual knowledge, growth and development in 2003. To date, Christopher continues to expand his spiritual mission, visions and gifts to help everyone within the universe who needs assistance. Christopher remains one of the strongest forces in the psychic, spiritual, metaphysical and New Age arena. Q. How can I book Christopher for a public or private event? A. Please contact the "Booking Inquiries" section of the website. Please note: group/home readings are no longer available due to Christopher's ever-expanding schedule and the demand for his time and spiritual services. Q. Where can I find a copy of Christopher's latest book? Q. I want to schedule a radio interview with Christopher, who do I need to contact? Q. I will be attending one of Christopher's upcoming lectures. Who can I contact about getting backstage passes and/or attending a meet and greet with him? A. Due to Christopher's schedule when on tour, we are unable to grant backstage passes in advance. Whenever there is time following the end of a lecture, Christopher generally goes out front to the merchandise tables to meet & greet people. This is a time to say 'hello' to Christopher, not a time for readings or personal questions. Q. What are some of Chris' favorite charities? and/or "My organization is doing a charity auction, would Chris be able to donate his services for a good cause? A. Chris loves to donate to various charities. His favorites include All Childrens Hospital, Red Cross, Toys for Tots, Tsunami Relief, National Foundation for Cancer Research, The Aids Memorial Quilt - The Names Project Foundation and several others. If you'd like Christopher to consider donating a reading or gift certificate to be raffled at your upcoming charity auction, please send us a written note on your charity/company letterhead to Christopher Reburn PO Box 4008 Clearwater, Florida 33758. Written requests only. Q. When is Christopher coming to my hometown or a city near me? A. Christopher's tour schedule is updated regularly. Be sure to check the tour schedule and In Person Readings schedule sections of the website. If you do not see anything scheduled near your city, please stay tuned as we are constantly adding new cities and dates. Q. How do I send mail to Christopher? A. You may email Christopher at ThePsychicSpirit@aol.com Due to the amount of emails that he receives, we are unable to guarantee a personal reply. Do you have a question that we didnt cover? Please feel free to email us at ThePsychicSpirit@aol.com and we'll be happy to answer all your questions on Christopher and his work! please CLICK HERE to learn how you may receive a reading with Christopher Reburn.